Quincy lost 85 lbs. and 4 pant sizes. "People don't recognize me!" "GNLD GR2 Control works like nothing else! I've gone from 310 lbs. to 225 and nothing fits: clothes, shoes, wedding ring or watch! My confidence level is through the roof, and my health is 100 times better." 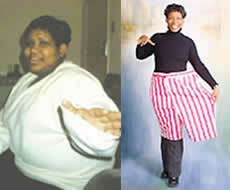 Gloria lost 145 lbs., 9 pant sizes. "They said I'd be fat for the rest of my life. Look at me now!" "This year, I won't have to wear a size 28 bathing suit with a little skirt on it, because now I'm a size 10! My life has completely changed since my parents introduced me to their GNLD products. I've lost 145 lbs. with GNLD. 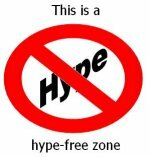 Today, I can wear shorts, slide into theater seats, amusement park rides, and car seats comfortably, fit in the shower, and work out with ease. I'm not the same girl! Everything from my social life to my self-confidence is different. I can't believe all the attention I'm getting; the phone rings off the hook! Now I can shop at 'regular' rather than large-size stores. When I walk down the street, I radiate confidence, and people notice me. I feel great -- my knees and ankles don't hurt. And I've learned to use food for fuel, rather than eating when I'm not hungry. People used to doubt me, saying, "you are going to be fat for the rest of your life." But I've proven them wrong, and I'm proud of myself. I'm so happy, I glow!" 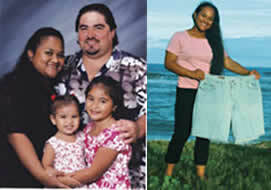 Anela dropped from a size 22 to a size 9 in 4-1/2 months! "I feel beautiful, thanks to GR2 Control Program!" 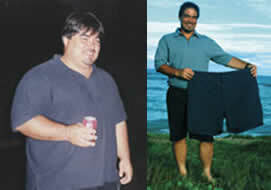 Christian lost 131 lbs., 54 inches. "I have more control over my mind and body with GNLD's GR2 Control!" "For the past 9 years, I've struggled to lose weight. I tried so many programs like Diet Fuel, Slim Fast, and Dieter's Tea. All of them failed! In just 5 months on GR2 Control Program, I've lost a staggering 131 lbs. and 54 inches. I've gone from size 50 pants to a 36. My life has changed so much. I'm far more active. I have so much energy and feel more alert. I'm able to keep up with my two young kids and play with them more. After work, I go for one-hour walks or run 4-5 miles a day. The people around me have noticed a remarkable difference in my attitude. I feel happier and more confident with my new body. GR2 Control has given me much more than weight loss. I've learned that I can achieve anything I put my mind to. 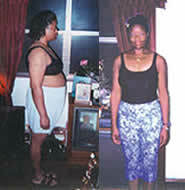 GR2 Control has improved my health and my outlook on life!" 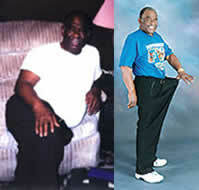 John lost 117 lbs., 7 pant sizes. "I've lost a whole person, and gained a new life!" "Before GR2 Control, I felt like there was a piano on my back. All I wanted to do was sit, because I tired so easily. But now at 184 lbs. with a 36" waist, I have an unlimited supply of energy like the Energizer Bunny! My arthritis and blood pressure have improved dramatically, and I can tie my shoes easily. I fit into jeans with narrow legs - and can even cross my legs! Even working on my '57 Chevrolet is a lot easier. My GNLD business has grown at least 20%, allowing me to buy a new wardrobe, new shoes (2 sizes smaller!) and more. I never thought losing 100+ lbs. would make such a difference, but it has. GR2 Control has changed everything. The best part is now my wife, Shirley, can get her arms around me!" Chuck lost 43 lbs., 8 inches. Charlotte lost 27 lbs., 11 inches. "I feel 30 years younger! I'm amazed when I look in the mirror!" "For the first time in my life, I feel in complete control of my health and weight," says Chuck. "No more arthritis pain, my back and knees feel better, and I'm no longer borderline diabetic! In just 7-1/2 weeks, my total cholesterol went from 264 to 166, my triglycerides went from 385 to 82, and my blood pressure and blood sugar are now normal. My cardiologist is thrilled. I feel wonderful about the new me. I have 'spring in my step'. I thank God and GNLD for GR2 Control. I feel 30 years younger! GR2 Control is a Dieter's Dream." 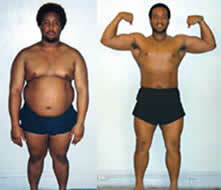 "Before GR2 Control, I was at my highest weight ever. My cravings for chocolate, cookies and pasta had caught up with me. My inactivity didn't help. The weight piled on year after year. I tried cutting out bread, pasta, chocolate and cookies. I started to believe that the extra weight was age-related and that I couldn't ever be slender again. After experiencing great results with GR2 Control, I feel like I'm living a dream, because it's been just too easy! I've lost 27 lbs., including 5 inches from my waist and 6 from my hips. I'm amazed when I look in the mirror. I've gone from a tight size 14 to a 7/8! I feel lighter, energized and younger. Chuck and I love the shakes, the mini-meals, and our main meals. GR2 Control has changed our lives!" 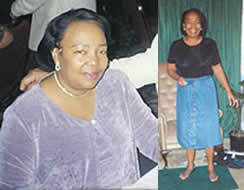 Margaret lost 35 lbs., 3 dress sizes. "I still enjoy my food!" "I like GR2 Control because you're free to tailor the plan to fit your lifestyle. At first, I thought I'd starve, but when you think about it, every time you turn around, it's time to eat again! You really can learn to eat the 'Enjoy' foods, follow the program, and lose weight. I did it!" 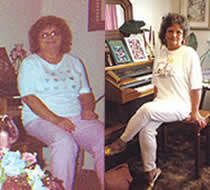 Dianne lost 47 lbs., 5 dress sizes. "GR2 Control has turned my life around!" "GR2 Control has changed my health, my look, and the way I feel. I've lost 47 lbs. and 5 dress sizes and my diabetes symptoms have disappeared. I no longer take insulin! This program gives me so much energy. I've even started to exercise regularly. I feel more positive and in control. I've even stopped smoking! GR2 Control has taught me how to eat properly and keep my body in top form. I love GNLD GR2 Control!" Shirley lost 35 lbs, 23 inches "I bought a new dress for Christmas!!" "One of the great things about losing weight is you get to splash out on a new wardrobe. I even bought a new dress for Christmas. When I tried it on later, I realized I had to get it altered because I had already lost more weight and it was very loose on me! That's a good feeling!"